I find myself wanting to distance myself from my phone more and more. But I need a device to listen to music/podcasts etc. I may be asking for a lot, but I’d like to be able to download Spotify playlists to do away with ripping CDs. To the best of my knowledge this is limiting to iPod touch or hidizs ap200 (android based hi Def player). I looked at the “mighty” device but it seems very faffy. Any other suggestions. (Or just engage airplane mode on the phone!). 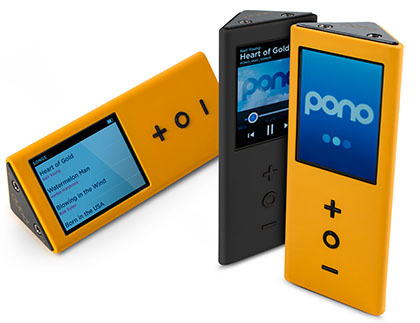 What ever happened to Neil Young’s media player? Was that the crazy traingular thing? no messy media handling through proprietary software/protocols, connect your player, open in finder/explorer, drag and drop files, done. I have one of those, dented from a drop but is still a great player. However as I stream music more n more it sits make sad eyes at me! I wanted to put rock box on it, but turns out I have the version that isn’t compatible. I may have to just bite the bullet and open (download) my iTunes account. Not sure why you’d want to do that, but no the one I suggested above won’t really do that afaik. As I understand it Spotify app supports “offline” play of ~3000 songs. Seemed like a useful feature if a portable player could host them. Haha, that still looks mad! Did it every get made? I use the download feature in Google Play Music a lot. Used to do it with my iPod, but the software eventually thought my iPod was too old. I’ve thought about this, but for me it’s one more thing to carry around, forget to charge, and throw in a landfill one day. I’ve just been trying to be more disciplined and intentional with how I use my phone (getting rid of FB and IG helped a lot!). Ah yeah, hm, I’ll be following this thread if there’s something that has been put into place for that use. I’m pretty anti-streaming, so it’s just not on my radar. Its an alternative firmware for the ipod classic (and other mdeia players). And here’s the why. (For me, it was going to be an intersting endeavour). You have my gratitude for sharing this. First uMatrix, now this - Lines is a right treasure trove of info about useful little programs. I’ve been using a 6th gen iPod classic all these years. For a long while I was moving music to and from it via foo_dop, without so much as an iTunes installation. But rockbox here is a step up - a simple drag & drop process, a low-memory, unbloated non-Apple firmware and a whole host of gloriously uncool skins. This has also made the iPod viable again as a looping sample player for a couple of forthcoming shows - for some reason, the gapless looping on the Apple firmware had ceased to function. Thank you! that is a point indeed. Though I must say that in the last 10 years (or more) I had to change quite a few phones because they stopped working, while I have only changed my portable music player once (and my wife now uses my old one, so nothing went to the landfill). I did try to use the iPhone for music… but it’s just so much of a hassle that I don’t want to bother with. I’m curious, how does that work practically speaking? Does it use some proprietary thing to make sure you don’t share these around? How does it download the tracks? I think it’s downloaded through the app and there is DRM applied. I guess it’s a similar method to Amazon music that splits the file into two locations (I believe). In which case, yes you’re stuck with something that will support their DRM scheme. Keep in mind that that might also leave you on foot whenever they decide to not support something anymore or for whatever reason Spotify closes down shops. Absolutely. Haven’t bought into Spotify yet and that is one of my issues with the streaming of music (and artist payment). I’m going to try and reflash my iPod firmware as it seems to have went weird. And, as mentioned above, less wasteful.